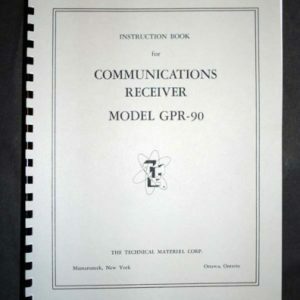 For sale is reprint of TMC GPR-92 Communications Receiver manual. Manual is 66 pages long. Includes 4 11×28″ and 1 11×17″ foldouts. 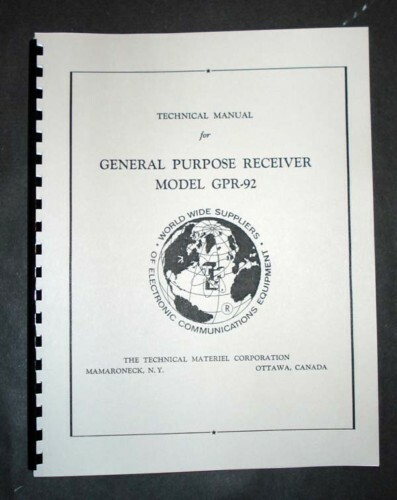 Manual is dated Dec 15 1964. Includes Sections on Installation, Operation, Alignment, Service, Part list and Test data. Comes with Voltage/Resistance tables for all tube sockets, helpful when troubleshooting. 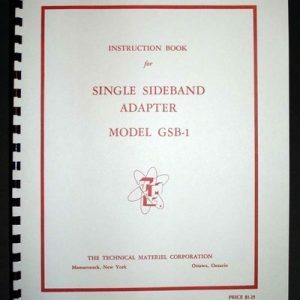 Includes 3 11×28″ foldouts of Circuit Diagram, 1 11×28″ Foldout with Block Diagram and 11×17″ foldout with Gear Train. Must for every owner of this very rare receiver.